Baba visits the Taj Mahal by moonlight. The New Life phase of Baba’s work ends. Still, Baba says the New Life will live on eternally, even if there is no one to live it. A dhuni (fire) is lit. Baba states that he now frees himself from external religious ceremonies. 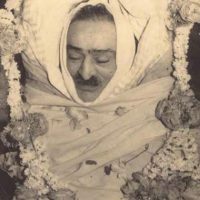 Meher Baba drops the body at 12 noon. Starting in January, 1970 this date came to be called Amartithi and is celebrated each year in India and around the world.